De La Salle College offered its first graduate and undergraduate programs in education in 1930 and 1959, respectively. Today, the Br. Andrew Gonzalez FSC College of Education (BAGCED) offers 10 undergraduate, 25 master’s, and 7 doctoral degree programs. BAGCED’s passing rates continue to be among the highest in the country (PBED 2014; finduniversity.ph 2018). It has several social engagements that have spanned decades, including the St. La Salle Preschool and Operation Big Brother. What follows is a vision for BAGCED (not to be confused with the vision of BAGCED) and a master plan for achieving this vision. These were crafted primarily from a qualitative analysis of the reflections of BAGCED’s administrators and faculty members on BAGCED’s strengths and areas of or for improvement.1 Other factors that were considered in the crafting of this vision and master plan were the university’s strategic plan for AY 2018-2022,2 and my own experiences in technology-enhanced learning3 and in Lasallian formation. The vision for BAGCED is one of inspired innovation for impact (I3), illustrated in Figure 1. Innovation is “change that creates a new dimension of performance” (Drucker quoted in Hesselbein, Goldsmith, & Sommerville, 2002 p. 1). Innovation—be it in pedagogy, technology, or content—is at the center of this vision for BAGCED. As St. La Salle was an educational innovator5, so will BAGCED be known in the country and region for innovation in education. At BAGCED, innovation is not for innovation’s sake. Following St. La Salle, we innovate because we have tough problems to solve. In other words, we innovate for impact, first in the lives of the individuals whom we teach or train, and, eventually, in the lives of the people whom our students will touch. In other words, impact is our reason for innovation. Impact is also essential for the use of a specific educational innovation to be firmly established, and for the process of educational innovation to be sustained. 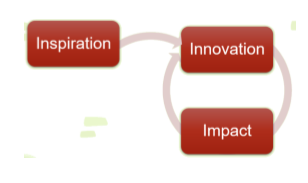 This relationship between innovation and impact is represented as a cycle in Figure 1. Innovation is change, and change is resisted almost universally. Moreover, the educational needs of the youth whom we serve are ever-changing and never-ending. Therefore, commitment to the kind of innovation that we are after is very difficult to obtain and sustain. Again, we follow St. La Salle in drawing inspiration—zeal, wisdom, and strength—from God. We also draw inspiration from the story of our Founder, and from one another in communion. In this sense we call our innovation inspired. 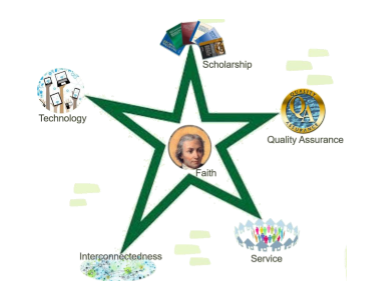 Our master plan to achieve inspired innovation for impact has six components (Figure 2): faith, scholarship, technology, interconnectedness, service, and quality. At the center of the master plan is faith. Faith will enable us to draw inspiration—zeal, wisdom, and strength—from God, from the life of the Founder, and from one another, in order to consistently innovate for long-term as well as short-term impact. To enable us to draw inspiration from God, the life of the Founder, and one other, we in BAGCED will study together—first the administrators, then the academic and support staff with the students—the life of St. La Salle. Brother Luke Salm, FSC, has written a beautiful biography of St. La Salle that is accessible to lay persons (Salm, 1996). In my experience, studying this biography in the light of God’s Word will not only change lives; studying it with others will also establish bonds of friendship that will stand the test of time. More than two decades ago, Ernest Boyer (1990) proposed four priorities of the professoriate: 1) the scholarship of discovery, or what we normally call “research” in a particular discipline; 2) the scholarship of integration, or what we now call interdisciplinary “research”; 3) the scholarship of teaching and learning (SoTL);6 and 4) and the scholarship of application, which was eventually renamed to the scholarship of (social) engagement. In other words, Boyer proposed that all the activities of the professoriate—not just research but also teaching and social engagement—be done in a scholarly manner. Lev Shulman (who would succeed Boyer as president of the Carnegie Foundation) would go a step further to say that the results of all these kinds of scholarship should eventually be peer-reviewed and published (Shulman, 2011), for the benefit of educational stakeholders not just in one’s institution but worldwide. I therefore call on all full-time faculty members of BAGCED to publish the results of their scholarship— whether of discovery/integration, teaching and learning, or social engagement—and to publish “upwards” or at higher levels of quality. 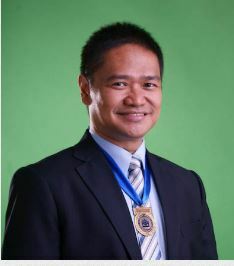 For example, following Table 1, a faculty member who has published in the proceedings of a local, peer-reviewed conference (Level 2), such as the DLSU Research Congress or the ARAL Conference, is therefore called to publish in the proceedings of an international, peer-reviewed conference (Level 3). As another example, a faculty member who has published in international, peerreviewed journals (Level 4) is now called to publish in the world’s top journals in a particular (inter)discipline (Level 5).